I'm not sure if you have seen or know about the Goji Smart lock that was being crowdfunded via multiple separate crowdfunding sites in the last couple of years, but a report out a couple of days ago indicates that this particular product has failed to launch. The Smart Lock market has been evolving for a number of years now and according to sources, is expected to rise from the current fledgling $8 Billion market to $120 Billion by 2025. There are a number of entrants that have evolved in recent years and we have written about a few of them. Products like the August Smartlock, the Lockitron and others. We have found that many of these "new breed" of stand alone wireless smart locks are being developed by entrepeneurs who lack industry knowledge, experience and longevity. The large industry players like Assa-Abloy, Yale, Schlage, Kwikset, Master and others who have been in the security product manufacturing industry for a great many years, are also firmly entrenched in the Smart Lock market. But the difference between these industry stalwarts and the current breed of new entrepeneurs has much to do with their successes developed over many years of R&D, interaction with their customers and tried and proven manufacturing practises that continue to produce the high-quality requested by the consumer driven market. Goji, obviously was seen to have merit and raised about $800,000.00 through multiple crowdfunding sites including Indiegogo and Fundable. This news is not surprising really. there are many entrants to the smart lock market that appear to not have done their due diligence and market feasibility studies prior to launch. Goji had developed a promising looking product that operated with Android and iOS operating systems, but I suggest that the actual integration of these sophisticated smart phone operating systems proved too much for the Goji team to master. 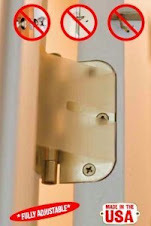 Bilock Extreme Security products just release the newest addition to their product line. 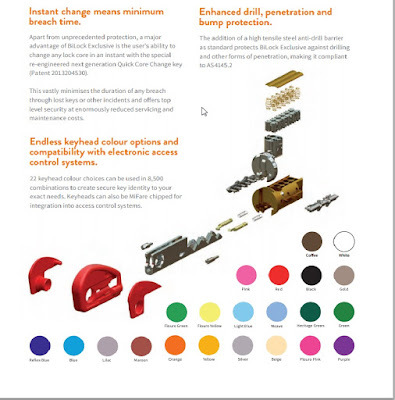 A completely new rendition of the fabulous extreme security mechanical key system. 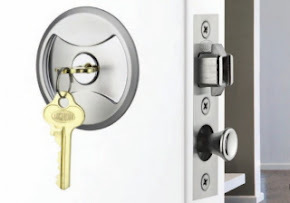 This new update to the well-known Bilock high security restricted key systems, answers many of the criteria discussed industry wide by customers, hobbiest forums, locksmith industry forums, engineers and government and military experts. The new line is called Bilock Exclusive™. This new design, actually increases the security of each new cylinder while removing the trigger interactive element. Colors for the key heads are still pretty much the same, with 21 color choices comprising 3 parts, effectively offering about 9250 color combinations. A new style of head with the three interlocking parts is still used. The product still uses the innovative Quick-Change-Core technology that Bilock is famous for. Dealers will probably need a little retraining in the construction of the new cylinders, but key creation is identical and used with existing machinery, so no new tool equipment to purchase other than the new keying kit and cores/cylinder bodies. We believe that existing cores (from older systems - New Generation) can be used in the newer cylinder bodies, but the new cores cannot fit into the older cylinder bodies. This new product increases the patent protection for the Bilock product for another 15 years while increasing the security of each core by doubling the side-bar blocking pins, directly making the ability to pick, impression or bump the lock virtually impossible. The introduction of Mifare™ chips into keyheads is also now possible for connecting with electronic access control products that might exist in different customers networks. Release date to the USA and North America markets are unclear at this time, but we expect to offer the newer system by next summer. Many of us like to pursue bicylce riding as our hobby and passion. Often gearing up involves expensive equipment purchase so we can enjoy this fun and healthy passtime. There are many iterations of products available in todays market that provide solutions to our need to secure our bicyles, but once in a while, a product surfaces that ticks off many of the criteria sought by so many but not available by so few. The SeatyLock is one such product. You can hang a chain and padlock around your bicycle frame, that dangles as you ride, attach a D lock to the frame, use a bottle lock, or any multitude of bicycle security products that we have written about previously. The Kuna is a sensational new product recently released to the mass market that can become your video peephole, a product that fills a wide and unfulfilled market segment. We have posted about wireless peepholes and closed circuit camera systems in the past and received some interesting feedback about these products, but once in a while along comes a product that singularly changes the perspective. And does so for a realistic entry price. The Kuna system offers distinctive styling while appealing to both the nouveau and rustic styled home owner. This intelligent product combines the benefits of real time security with convenience, in our wired/wireless lifestyle. Simply replace your current outdoor light with the easy to install Kuna. Connect to your wifi and app and that's it. Because the unit is hardwired to our residence (in place of the current light fixture), no batteries are required. Low voltage application means no electrician is required to complete the install. It is a real DIY product. 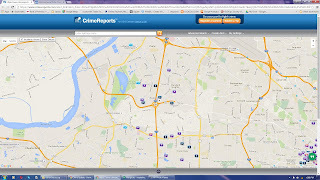 Pictured below are some maps provided by Crime Reports that show 3 regions within the St Louis Metropolitan Area that identify the locations of Property Crimes, Robberies and Break & Enters, that have occurred in the last 30 days. Many home buyers like to research information about their desired neighborhoods to live in and knowing the number of crimes reported recently in those areas, provides valuable data when determining the price they want to pay for a home in a particular neighborhood. 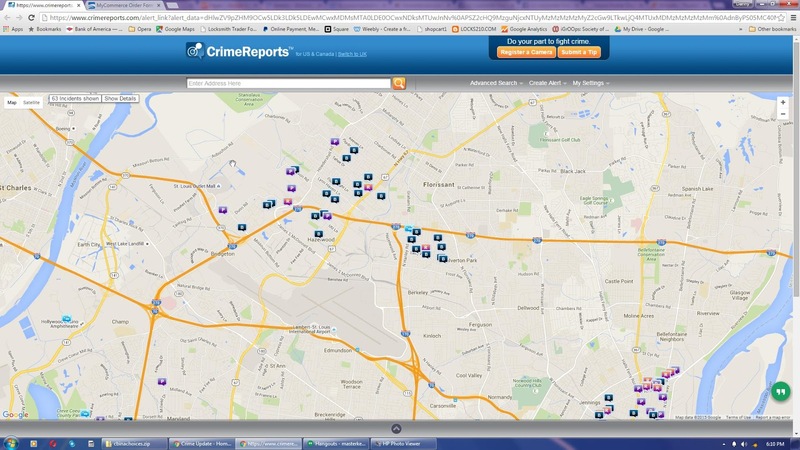 Pictured to the left are the Maryland Heights/Creve Coeur areas. 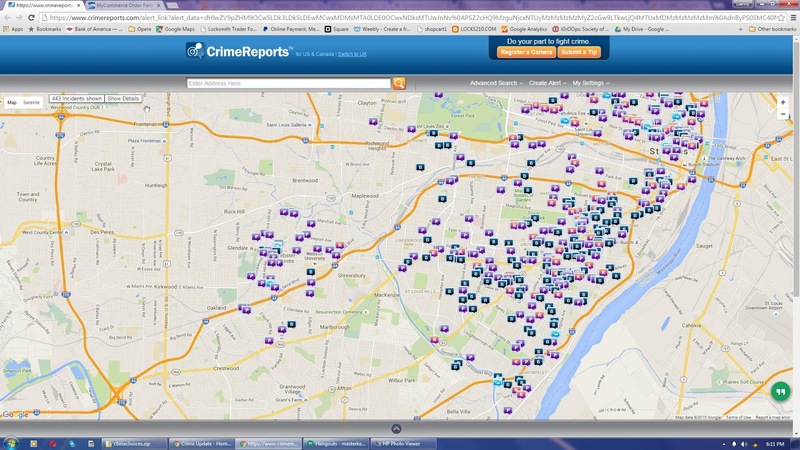 Pictured to the left here are the Florissant/Hazelwood/Bridgeton areas. Pictured to the left here are the downtown/south city/Webster Groves areas. 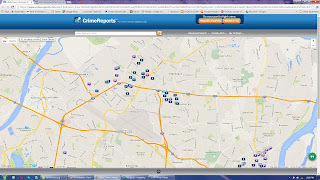 We selected to only show the last 30 days activity of reported crimes, that are specifically Robberies, Property Crimes (which can include instances of theft or damage etc) and Break & Entering. 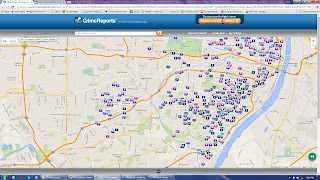 You can determine your own reports by visiting the Crime Reports website (in the source below), where you can select fine details including particular street names and different crime types, that might fit your chosen criteria. This information will prove helpful to real estate professionals, home buyers, property valuers as well as security system providers. We are pleased to announce a new "Buy Now" link on our sister site that enables you to purchase the Meroni Nova Passage Set. There are multiple color options available at diferrent costs, but essentially we have a considerable inventory of varying colors. Each passage set comes with your choice of latch mechanism, a square strike plate and your choice of nylon or metal roses. We have included some of the colors we have in stock but we also have many other varying colors that might appeal to differing tastes. The prices listed therein are the list prices for the products per unit. We will be pleased to offer substantial quantity discounts to customers who choose to contact us directly. The Meroni Nova product is exceptional quality made by an established Italian company, Serrature Meroni. We are the North American distributors for this fabulous product line. Premiapri Nova handlesets are the original line produced by this famous Italian company for over 45 years. The unique functions and operations are unlike any other product you may have seen before. The handle/knob doesnt turn. The button on top is the activator of the latch mechanism. This can be especially helpful to consumers who may be physically challenged or arthritis sufferers. Other versions will be coming online soon, including keyed entrance, privacy/bathroom, hotel/motel functions. In the very near future we will announce a new product that will change the Smartlock market too. In March 2016, we will be displaying the fabulous Meroni Product Line at the St. Louis Home And Garden Show to be held at America Center in downtown St. Louis, Missouri. We cordially invite our customers and all interested parties to attend and see in person these beautifully designed products, have a play and feel the quality and view the other options including Premiapri Combina, Premiapri Forma and the amazing Pigio range of premium quality lever style handlesets. View the link in the source below to see the options available. Denver Police recently released a video they made with a former thief about the pitfalls of holiday season shopping. The fellow in this video highlights excellent points that all shoppers, especially holiday shoppers require to be aware of and take precautions to avoid. The person in this video informs us that we all need to be much more vigilant and self protective, because there are a great many nefarious characters just waiting to prey upon our negligence. 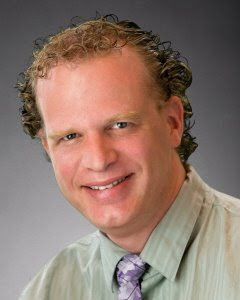 I believe it is my responsibility to provide information and education about products and services that increase your and your families personal and property security. The locksmith profession is one of the oldest professions, dating back to medieval times. Locksmiths came about because consumers have a need to find someone who can provide the better lock system to protect our properties, our dwellings and our families from the continually increasing instances of burglary and theft. As "Dave" points out, the thief doesnt discriminate. The thief doesnt care whom he causes harm to. The thief is always "casing" the parking lot for the opportunity to commit a crime. As a consumer or a parent, it is only our own responsibility to protect ourselves and our families, by taking preventative action to thwart attempts to steal, damage or cayuse harm to us, our friends or our families. Sometimes there is little that can be done to stave against some of the methods that these nefarious characters ply. 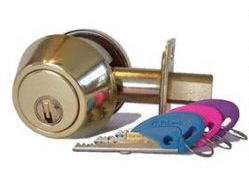 By contacting your local locksmith or consulting with an industry approved locksmith with accreditation from notable associations like the SOPL (Society of Professional Locksmiths), ALOA or a couple of other notable groups, the consumer might find ways and means to protect themselves, their friends, their families and their properties, this festive season. Providing security advice and offering quality security products and services are the principal aims of the locksmith trade. Not all locksmiths, just make keys to cars. We wish you the happiest and least stressful holiday season. We wish you a happy, healthy and secure festive season.